The former city of Bell manager plead no contest Thursday evening to 69 felony charges of misappropriating public funds and falsifying documents. 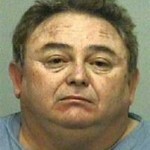 Prosecutors told the Los Angeles Times Robert Rizzo, 59, would be sentenced to 10 to 12 years in prison. In addition, the court is expected to order Rizzo to pay between $1 million and $3.2 million in restitution. Before he left his job amid outrage over city spending, his annual compensation was $1.5 million. Rizzo’s lawyer, James W. Spertus, said Rizzo is cooperating with authorities and claims his former assistant city manager, Angela Spaccia, was the architect of the corruption. In 2010, prosecutors filed charges against Rizzo, Spaccia and six current and former council members for defrauding the city of millions of dollars. I think he’d fit in very well here! He fleeces the public treasury and trust, and they only ask him to pay between 8 months and 25 months’ worth of salary he took? I’d say liquidate everything he owns! Frickin’ slap on the wrists for public servants are getting annoying! That’s if they’re even prosecuted! Mayor Irons!…Rizzo = bad…Lueker = good …simple enough? “Pay attention Paso?” More like pay attention SLO! Litchtig’s incompentence costs far more $$ than App’s does, if only in salary alone.